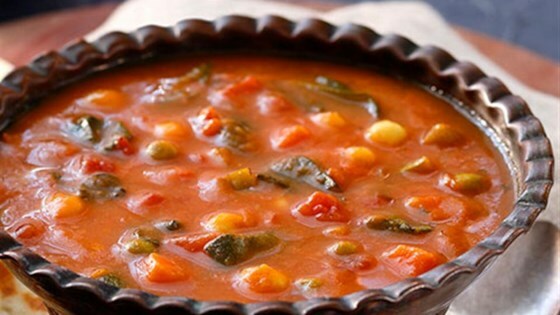 "The Indian spices in this dish make the kitchen smell as delicious as this soup tastes! Warm up some naan for an authentic finishing touch." Place the diced onions and one tablespoon of the vegetable broth in a large stock pot over medium heat. Add the peas and carrots, cumin, coriander, garam masala, and turmeric. Stir to mix in spices. Heat through, about five minutes. Add remaining vegetable broth, diced tomatoes and juice, and tomato sauce. Heat to boiling, stirring occasionally. Once boiling, turn heat down to simmer. Add potatoes and garbanzo beans. Stir until potatoes are thoroughly incorporated. Simmer until heated through. Add baby spinach and stir until wilted. Serve immediately garnished with chopped parsley if desired. This soup was not very good. Too much beans. The mashed potato mixture gave it a funny texture. It was better over a little rice but I will never make it again.